Texas Conservative Republican News: SREC Meeting Update: What is happening with Legislative Priorities Report? When is the Vote? SREC Meeting Update: What is happening with Legislative Priorities Report? When is the Vote? I was elected to the State Republican Executive Committee last year at the 2010 Republican State Convention. I don't play political games and I just stand up for Republican Values. I have never been on the SREC and that gave me the benefit of being able to see everything in a fairly unbiased way. My votes and decisions are not tied to any friends on the SREC (I did not have any on the SREC when I got in) and I do not play any political games. I just do what is right and stand by Republican values. When the issue of the Legislative Priorities Report came up, I thought it was pretty straightforward. The Republicans in Texas voted for it (the same people who elected us) and so we need to do it. Little did I know that it would not be that simple. Here we are now over a year later. I have heard all different reasons for and against the Report. The time is getting close for the report to be done but there are still many SREC members who do not agree on what to do. The big issue is whether or not this Report violates any bylaws. Before our last SREC meeting on October 1st, 2011, the RPT Chairman, Steve Munisteri (Who I think overall is a great Chairman), created an ad hoc committee of a few people to look into whether or not this Report would violate bylaws. There was a bunch of chatter on the internet about the legislative priorities report and there were a bunch of calls and emails from Republicans who wanted us to vote for the report at the Oct. 1st, 2011 meeting. The October 1st SREC meeting was held and we DID NOT vote for or against the report. So before anyone gets mad and thinks that the report was rejected, please know that we did not get a chance to vote on the report yet. At the Oct 1st meeting the SREC voted to allow the ad hoc committee to keep researching and report back to us with enough time so that we can have an SREC vote regarding the report at the December SREC meeting. In the meantime, we did vote to put a link on the Texas GOP website to the Texas Legislature Online so that people can see where to look up bills. I fully believe that this ad hoc committee will report to the SREC that a Legislative Priorities Report would violate the Bylaws. There has already been a proposed bylaw change that has been submitted to the SREC. I am almost certain that the SREC, at the December 4th, 2011 Meeting, will for sure be voting for or against the proposed bylaw change which would allow for this Report to be published by the RPT. If the SREC votes to change the bylaws then the report will most likely be published in some form or fashion. If the SREC votes against changing the bylaws then the SREC will not even be allowed to for for or against publishing the report. The vote in December to Change the SREC Bylaws is the Important Vote. I do not know if the bylaw change will get a 2/3 vote of the SREC to pass, but it is fair to say that the SREC members who vote against the Bylaw change are against the Report and the SREC members who vote for the bylaws change are for the Report. So even if we do not get to vote on the Report itself, you will be able to know who was for or against the Report based on who votes for or against the bylaw change. I am not trying to "expose" anyone or point anyone out. I do not know if anyone is a RINO on the SREC. There certainly might be. So far, I think the SREC members mostly great Republicans who mostly vote for Republican Party values and we mostly get along. That does not mean we always agree though and I have no problem telling a fellow SREC member that I believe they are wrong on a particular issue and then moving on and working with them on other issues. I will tell anyone on the SREC that they are wrong if they do not think we should publish a report. That does not mean I do not like them, or think they are a RINO, or do not want to work with them, but it does mean that I think they are wrong on this issue. Ultimately, the Republican Delegates vote for who you want to represent you on the SREC. I have no problem telling anyone how I vote on the SREC, and this bylaw change vote should be done in such a manner so that everyone knows who voted for it or who voted against is. It is just good to be open and honest. 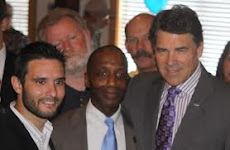 At the next State Convention in 2012, the Republicans in Texas can determine whether or not they agree with what we did. They can vote for us to be on the SREC again or they can vote for someone else to be on the SREC. That is the way it should work. We on the SREC and all other Republican Officials are not "entitled" to be elected again. We are elected to represent Republican Values our constituents. Our constituents should know how we vote so that they can decide whether or not we represented them, and the Party, properly. Update: There are a bunch of people taking the survey so the survey is not letting everyone take it at the same time. PLEASE just try the link again or wait till later today! It will work, I promise! there are just a bunch of people taking it right now! Please PASS THIS SURVEY ON to all Republicans in Texas and I will email the results to the SREC and the Republican Party of Texas. This is not an official SREC survey. I am a member of the SREC and will be voting on this issue and debating the issue in the SREC. I want to make sure that the SREC knows what YOU think. So take the survey and pass it on! You can also post this survey website link to TWITTER or FACEBOOK and forward this email, or at least forward this link to the survey. Please forward this survey to every Republican you know so that we can get a good sample of what YOU the REPUBLICAN VOTERS have to say about this issue.